73 available Songs of Gratitude General Admission $15.00 Doors at 7. Music at 8. 619 S. Main Street. 73 available Songs of Gratitude Hope Lodge Ticket and Donation $25.00 Doors at 7. Music at 8. 619 S. Main Street. Heartwood Soundstage, April 26, 8 pm. A benefit concert for Hope Lodge. As many know, Heartwood cofounder Bob McPeek took a leave of absence from Heartwood to receive radiation and chemotherapy for throat cancer. It’s now almost 3 months since treatments ended, and he is recovering well. He credits his recovery to his wife Nancye and our community of caring and amazing people. Our friend Gregg Jones calls this community The GainesVillage. 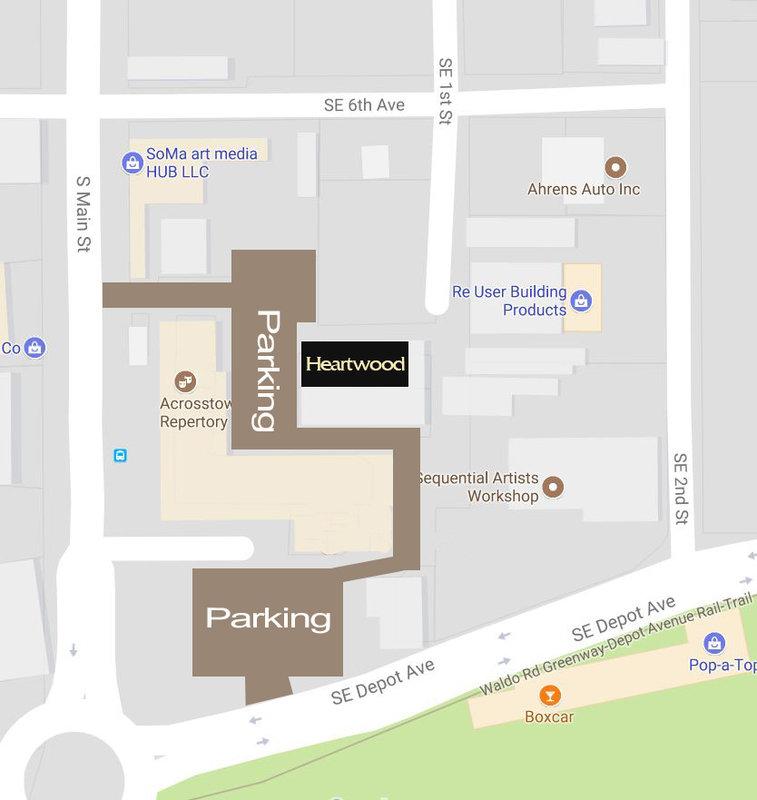 That name resonated with us, and so Gregg and Bob want to celebrate our home with GainesVillage-themed events at Heartwood Soundstage. Our inaugural event is a Songs of Gratitude concert on Friday, April 26 at 8 pm. The focus will be on the enormous healing power of music for all of us. Bob says listening to great music and creating his own has sustained and nourished him my whole life, but especially the over the last few months. Weknowhat Heartwood supporters understand this power. So, please join us in this celebration of gratitude, of music, and of the GainesVillage we are all a part of. The evening will be hosted by Gregg Jones and Bob McPeek, and with our musical guests we will present songs to comfort, inspire, and make us smile. Presenting these songs will be lifelong friends and fabulous songwriters and singers, each of whom helped Bob get through the treatments and recover. These kind and talented musicians include Sam Pacetti, Lis Williamson (of Gatorbone), Maggie Clifford, Other Voices (Fagan Arouh, Dan Tampa’s, Michelle Ott, Alan Hill), Janet Rucker, Maggie Rucker, David Beede, Cathy DeWitt, Mick Marino, Keith Peters, Michael Beasley, Michael Beason, Earl and Mari Robbins, and Fay Baird. Bob McPeek will also debut two new songs written over the course of his recent journey. Ticket sales will benefit The American Cancer Society’s Winn-Dixie Hope Lodge, a national program that provides free accommodations for patients (and their caregivers) who are getting treated for cancer away from home. Free from worry about paying for lodging, guests can focus on what’s most important: getting well. In addition, Hope Lodge helps address emotional needs by offering a supportive community where patients share experiences with others who are facing similar challenges. At the depths, we hold the vision of ours Songs of Gratitude event as a healing beacon. The GainesVillage makes our lives better, and we know it does the same for many of you. Let us now gather and make this an unforgettable evening! We hope you will come and share the gift of gratitude in this amazing listening room that is Heartwood, and witness the power of music to heal.